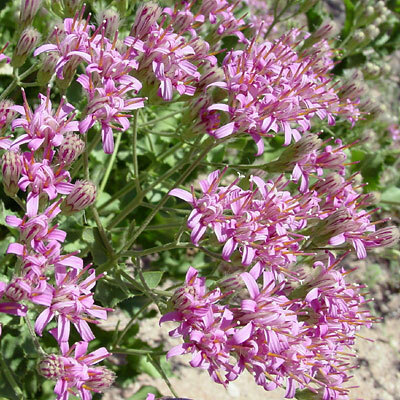 Description: There are 8 to 12 florets in each 3/4 inch (1.9 cm) wide flower head. 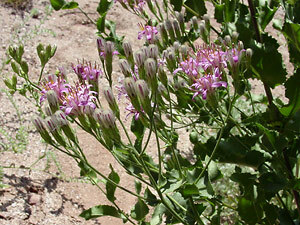 The flowers are in terminal clusters and are followed by fluffy seed heads with cream-colored bristles. The dark green leaves clasp the stems and are simple, sessile, alternate, and oval to oblong in shape with rippled, spine-toothed margins. There are brown hairs at the foot of the stems. The similar Acourtia thurberi has only 3 to 6 florets in each flower head. Fragrant – The flowers have a floral honey scent.